TEMPORARILY OUT OF STOCK. DUE IN APPROX 13 MARCH. ORDER NOW TO ENSURE PRIORITY SUPPLY ON ARRIVAL. 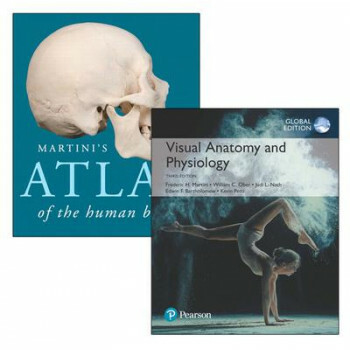 This pack contains 1 copy of Visual Anatomy & Physiology, Global Edition and 1 copy of Martini's Atlas of the Human Body. Using Art Effectively with the Most Visual Approach to A&P Visual Anatomy & Physiology combines a one-of-a-kind visual approach with a modular organisation that uniquely meets the needs of today's students-without sacrificing the comprehensive coverage of A&P topics required for careers in nursing and other allied health professions. The 3rd Edition presents key new features based on recent research about how students use and digest visual information. New modules in the first chapter emphasise how to use art effectively when studying; new Integrated Figure Questions increases the likelihood that students will spend time viewing the art and prompts them to consider what they have just learned; and new SmartArt Videos, accessible via QR code in the book, help students navigate key, complex pieces of art on some of the toughest topics. The Atlas supplements the textbook with an abundant collection of anatomy photographs (194), radiology scans (53), and embryology summaries (21). The anatomy photographs extend the anatomy photographs that appear in the book. The radiology scans help students visualise deep anatomical structures and encourage them to become familiar with the types of images seen in a clinical setting. The embryology summaries depict the developmental origins of major tissues, organs, and body systems.